Sorry but how cool are this couple? 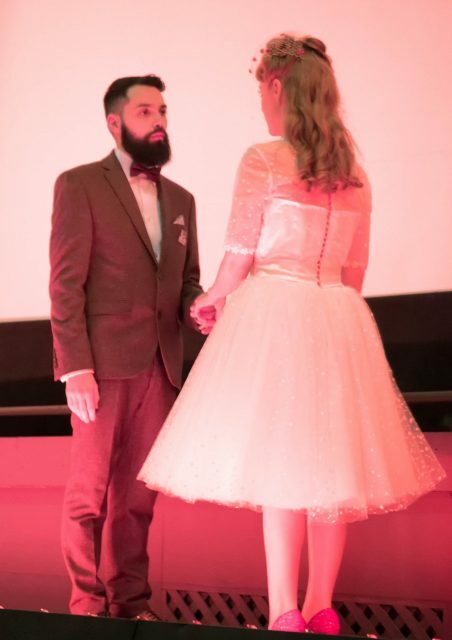 Kitty & Dulcie bride Victoria looked totally dream-a-licious in our Hopelessly Devoted wedding dress and didn’t her beau look dapper too. 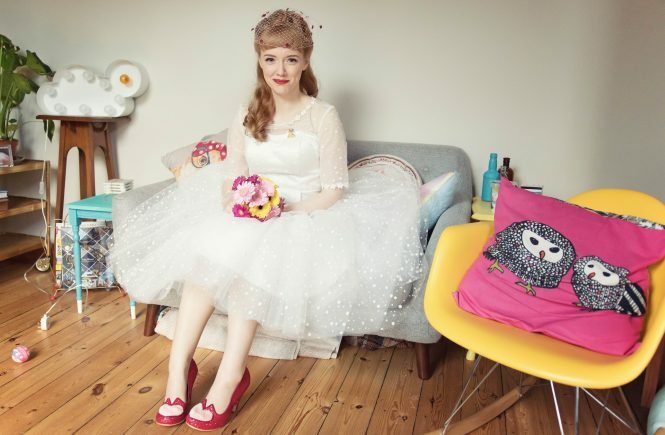 Oh and those Irregular Choice shoes and that Crown & Glory Veil. Be still our beating hearts. More pics to come of their big day in an upcoming post. Victoria’s Mum sewed tiny red glitter heart buttons to the back of her Hopelessly Devoted gown to match the Crown & Glory veil. Adorable with a capital A. 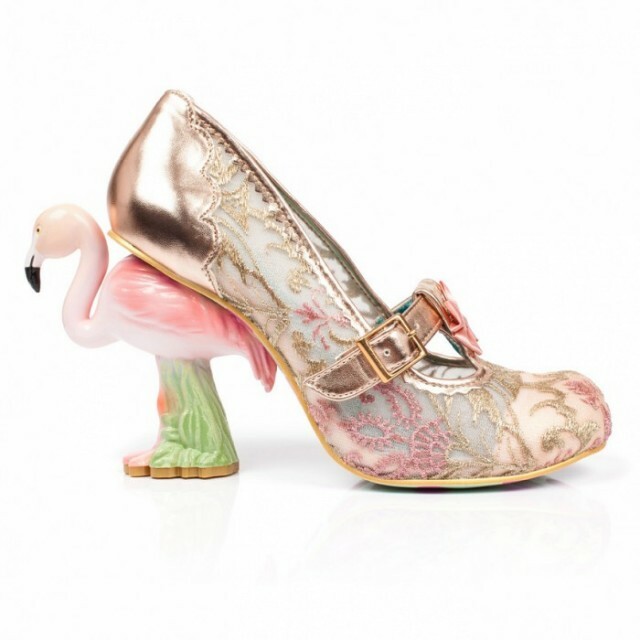 On the hunt for some amazing foot candy for your big day? 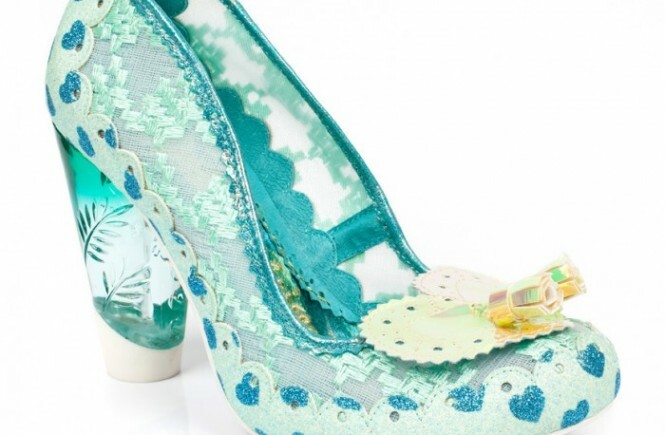 Check out ten wedding worthy beauties from our friends at Irregular Choice. 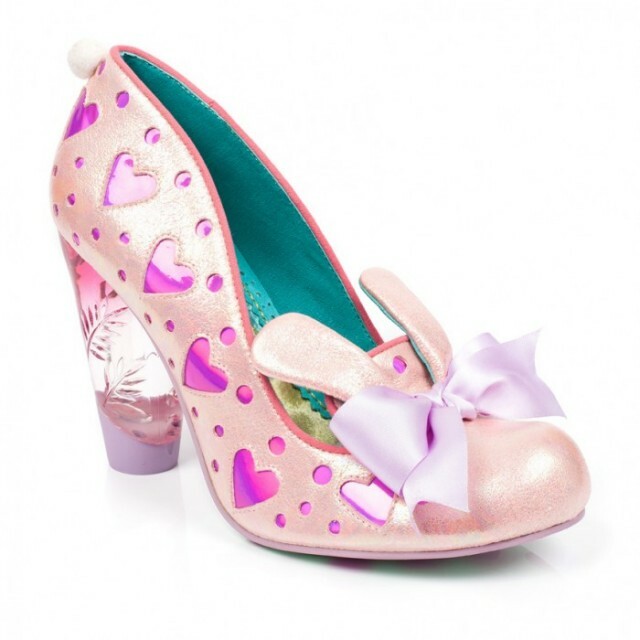 ‘True Love’, £125 from Irregular Choice with unique light up heels. 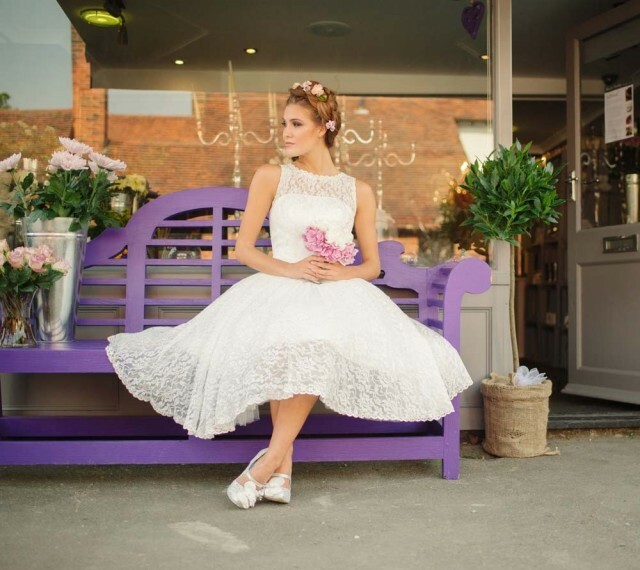 We’ve teamed our ‘Fiesta Flame’ bridal gown, £325 with ‘True Love’ heels from Irregular Choice. 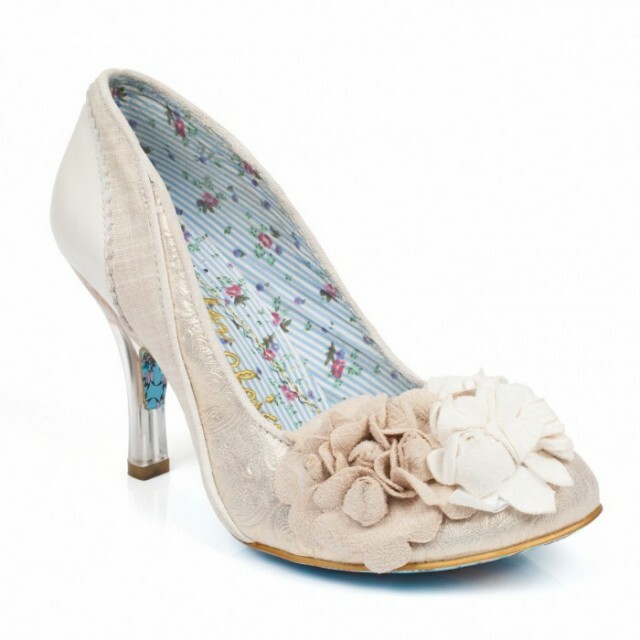 ‘Mrs Lower’, £99.99 from Irregular Choice stunning ivory and metallic patterned fabric with elegant suede flowers. 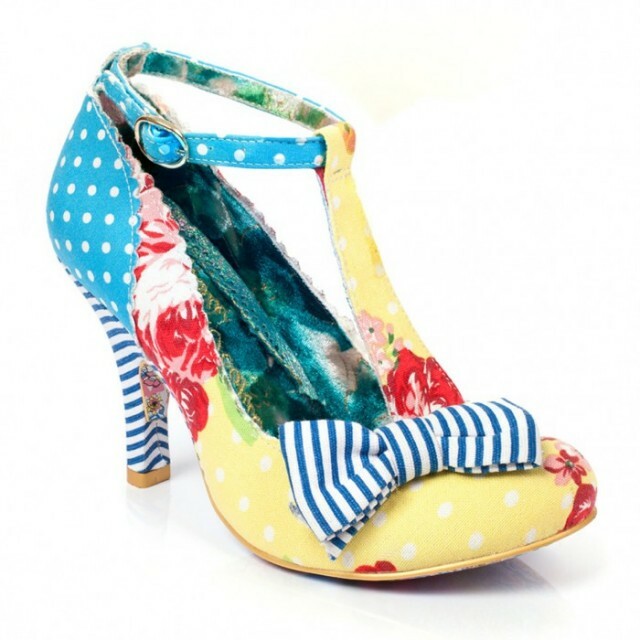 You’ll find a cute bouquet of flowers hidden within the heels too. 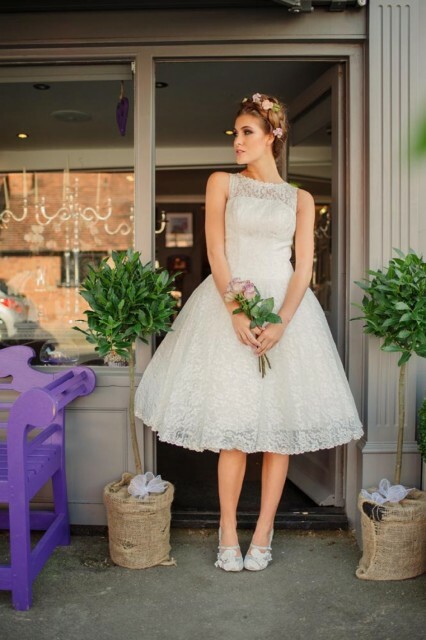 Our ‘Dame Dulcie’ wedding dress, £350 seen here with ‘Mrs Lower’ heels – the perfect pairing. 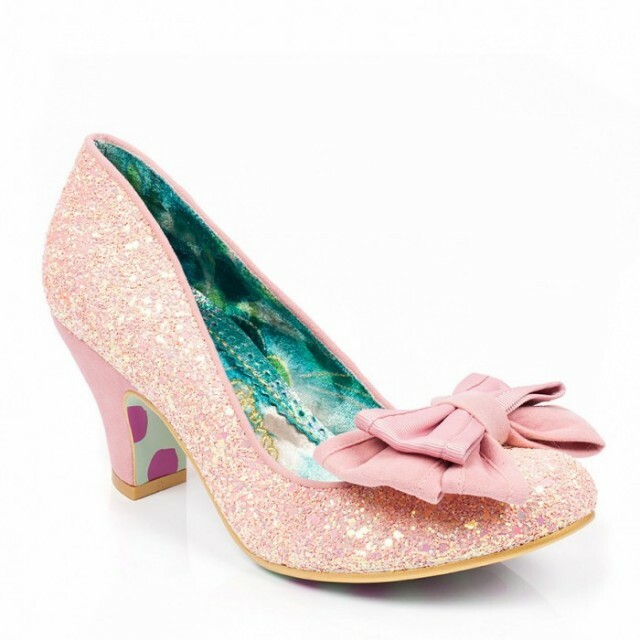 ‘Trinkletina’, £94.99 by Irregular Choice. 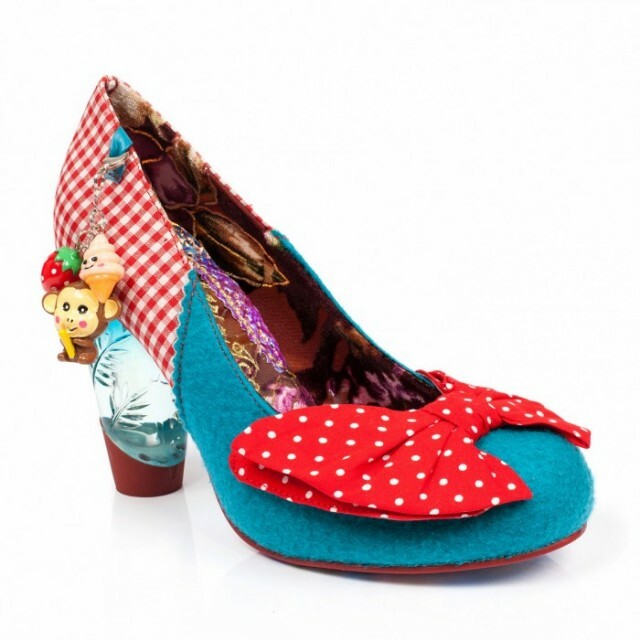 Turquoise lucite heels with statement red polka dot bows and delightful trinkets for all you cheeky monkeys. 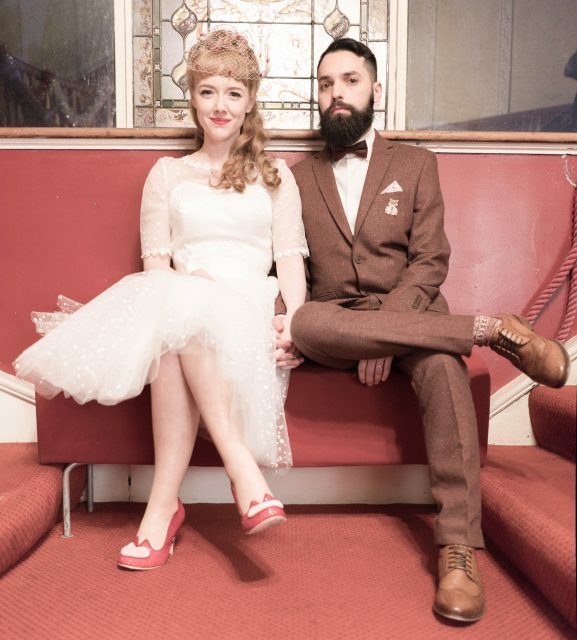 Our ‘Baroness Pearl’ tea-length wedding dress, £345 teamed with our ‘Retro Red’ sash, £15, ‘Tweetheart Red’ motif, £5 and ‘Trinkletina’ shoes. Hope we’ve tickled your fancy ladies. 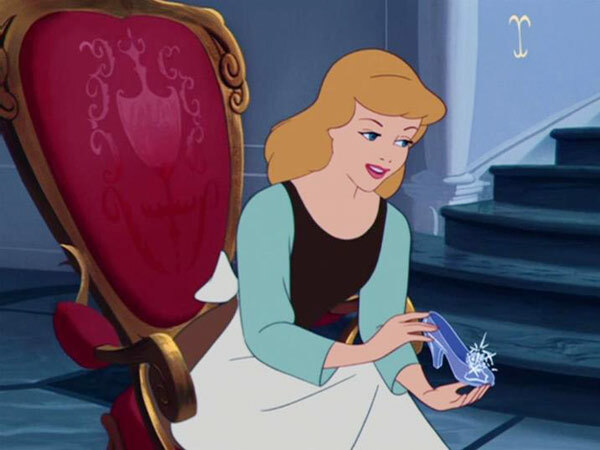 Happy shoe shopping. 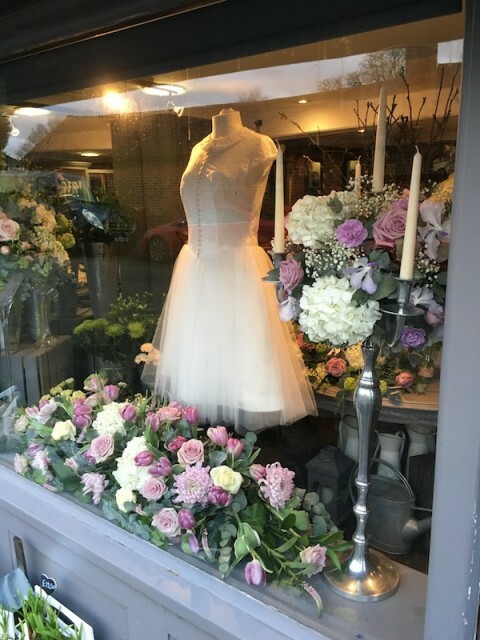 Our friends at Stock Florist are hosting Wedding Week at their stunning Essex boutique from 22 -27 February. 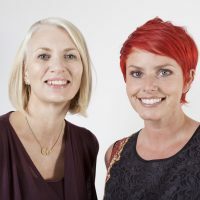 They’re inviting all 2016/17 brides to pop along and view some of their beautiful designs and one lucky couple will be chosen at random to a one off £250 discount when ordering their wedding day flowers. 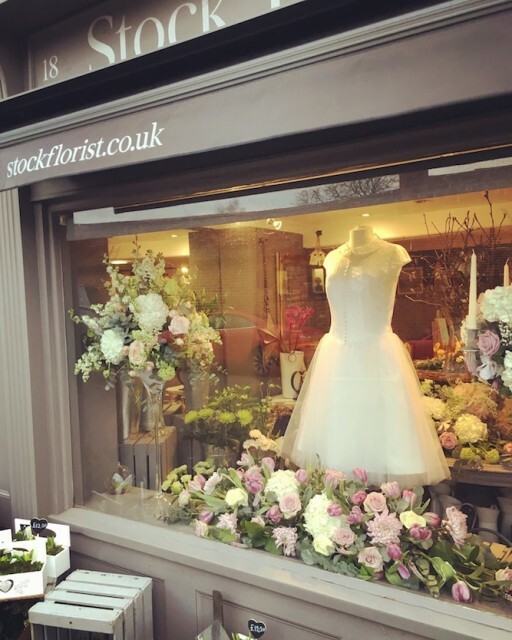 For more info contact enquiries@stockflorist.co.uk or call 01277 840350. 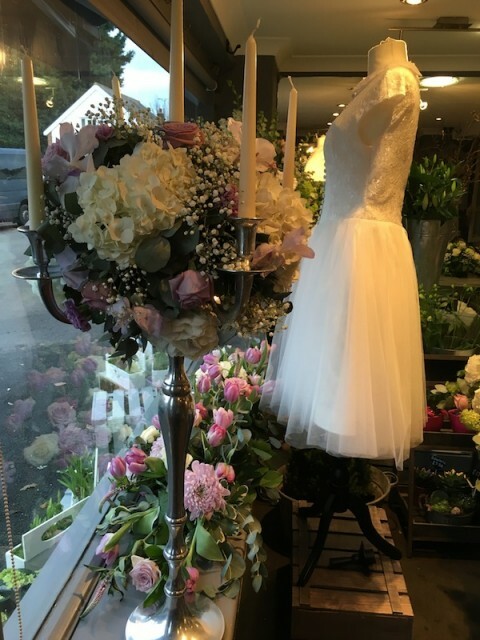 Our ‘Crazy For You’ wedding dress takes centre stage amoungst the prettiest petals. Stock Florist is located in the heart of Stock Village, open from Monday to Saturday 9am to 5pm. 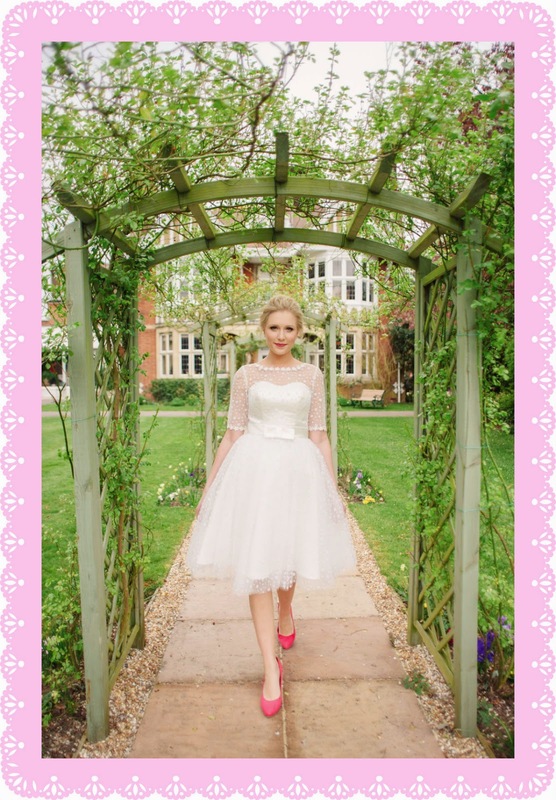 Kitty & Dulcie’s ‘Betty Blossom’ bridal gown. 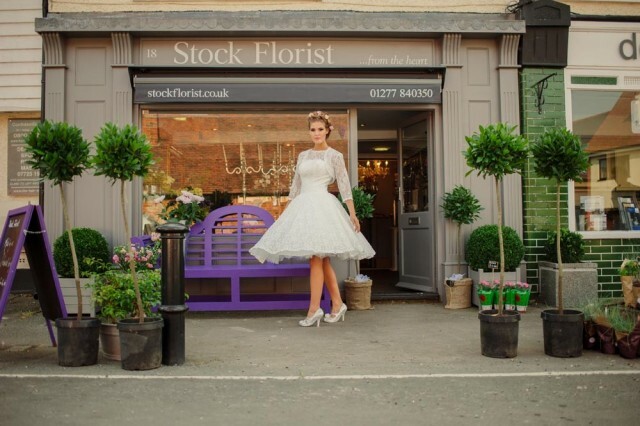 They’re all dancing in the streets during Wedding Week at Stock Florist. Model wears Kitty & Dulcie’s ‘Betty Blossom’ dress with ‘Betty’s Bolero‘ with retro heels from Irregular Choice.